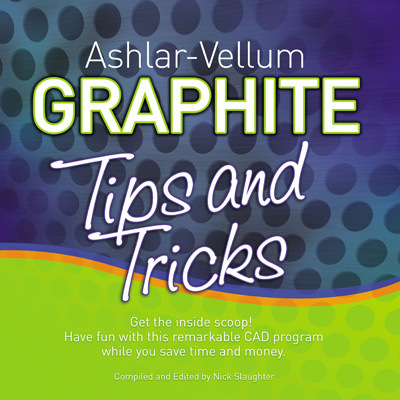 Get the inside scoop on how to make Graphite save your time and money with expert-level tips and tricks to help you make this remarkable CAD program even more useful and fun. A must-have book for any one who wants to master Graphite. This is it—the tips and tricks to make you a Graphite pro, to make you love your CAD software. At the same time you will work more efficiently and effectively. How about stringing tools and commands together for powerful performance? Or unlocking the hidden features of Sheets, Views and Models? And much more—the secrets of the experts are now at your fingertips. Whether you work on Mac or Windows or both, this book is designed for your computer-aide drafting success with Graphite. You’ll find the same tips and techniques for both platforms, just a few different keystroke combinations. Whether you are new to Graphite or you have been using Ashlar-Vellum’s legendary programs for years, this book will teach you many techniques that will save you not only time and effort, but money too. Even experienced users will be amazed at all the simple techniques and tricks that they never knew before.